Product #20825 | SKU AJ-PD500E | 0.0 (no ratings yet) Thanks for your rating! 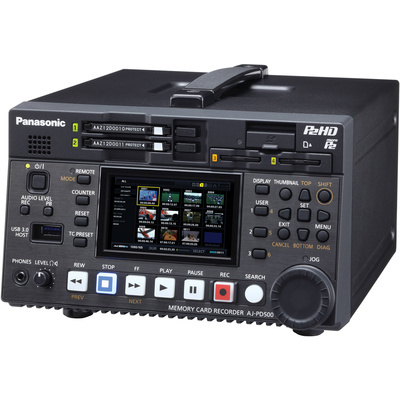 The Panasonic AJ-PD500 AVC-ULTRA P2 Recorder is an HD-SDI and SD-SDI recording system with slots for two P2 and two MicroP2 memory cards. It can record in a number of AVC-ULTRA codecs at up 1080p60 resolution, with 4:2:2 chroma sub-sampling and 10-bit colour. It is a flexible recorder that can be deployed in a number of production contexts These may include house of worship, production, post-production, long-form documentaries, live event systems, satellite facilities, reality television, news trucks, or to serve as a redundant playback and recording device in news facilities. Among the AVC-ULTRA codecs the AJ-PD500 supports are AVC-Intra100 and Intra50, which are I-frame only codecs that are designed to provide "master quality" recordings with minimal quality loss due to compression and are ideal when extensive colour correction or other post-production manipulations is anticipate down the road. For more efficient compression while still minimising visible quality loss, the recorder offers AVC-LongG50 and AVC-LongG25, which use inter-frame compression similar to AVCHD but offering 4:2:2 and 10-bit colour. In addition, a future upgrade from Panasonic will allow the AJ-PD500 to record in AVC-Intra200 for an ever high level of "master" quality recording as well as AVC-LongG12 and AVC-LongG6 for extended recording times where quality is less of a concern or where the footage will not be exposed to much colour correction or other forms of generational quality loss. Video can come from a variety of SD and HD sources. The AJ-PD500 features an HD-SDI/SD-SDI digital video input with embedded audio, two AES/EBU digital audio inputs, two XLR analogue audio inputs, timecode in and out, and reference in and through. It features a total of three HD-SDI/SD-SDI outputs with embedded audio; two are intended for the programme feed, and one is for a local preview monitor. It also has an HDMI output so that a consumer grade display such as an HDTV or computer monitor can be used as a cost-effective alternative to a broadcast monitor. There is also a composite monitor out for legacy analogue production monitors. Finally, it features two AES/EBU digital audio outputs and two XRL analogue audio outputs.